The Flipagram iPhone app creates smooth slideshows from your Instagram photos with elegant precision using a clean user interface. The graphics incorporate a subtle, retro-inspired vibe. 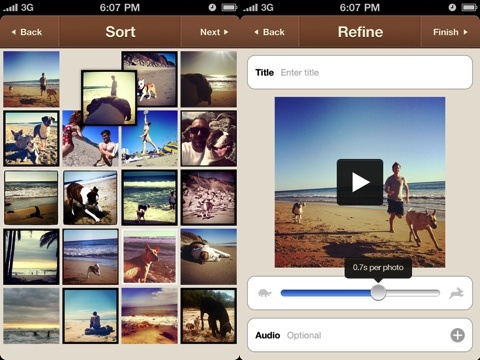 Flipagram’s nicely-organized slideshow construction process allows your life’s moments captured by Instagram to shine. The main screen in Flipagram is free of clutter and contains all of the tools necessary to quickly create your slideshow. You authorize Instagram by touching the menu bar at the bottom of the screen. After the quick process, you can select from the two large buttons in the middle of the screen–create or library. To create a Flipagram, your Instagram photos are loaded into a matrix. You select multiple photos to add to your slide show by touching the thumbnail on the screen. The next screen allows you to customize the order of the photos by holding your finger on a photo and dragging it to its new location. The gesture controls are responsive and accurate, and the same success in gesture controls moves into the final editing options. You add a title and select a custom font in two touches. To add audio, you are transported to your iTunes Music library for a quick selection. Two volume-style bars adjust the speed of the slides switching and the length of viewing time for the title. Your Flipagram iPhone app slideshow is quickly processed. You will by impressed with the clarity and seamless production, and you’ll be excited to use the one touch sharing to Facebook, Youtube, and email. The one I created of my son is precious, and the likes and comments on my Facebook timeline started pouring in instantly. You will add a new dimension to your Instagram photos with the fun, music-filled slideshows created by the Flipagram iPhone app, which sells for just $0.99 in the App Store. 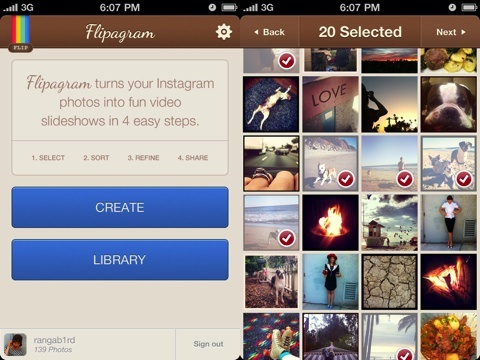 AppSafari review of Flipagram – Turn your Instagram photos into fun, captivating video slideshows was written by Jenni Ward on July 23rd, 2012 and categorized under App Store, Photos, Video. Page viewed 4967 times, 1 so far today. Need help on using these apps? Please read the Help Page.